One of the big messages from regulators this year has been concern about companies’ use of non-GAAP financial metrics. Well, I’m happy to say that Radical Compliance has just released one of the first in-depth reports on the subject, trying to understand how widespread use of non-GAAP metrics really is and what drives companies to use them. 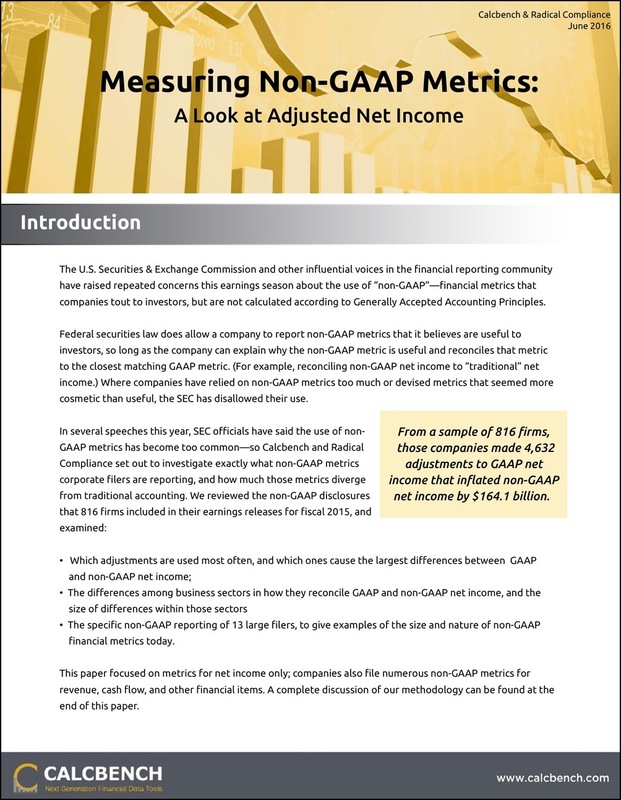 The report, “Measuring Non-GAAP Metrics: A Look at Adjusted Net Income,” is a joint project with Calcbench, one of the best financial data research firms around. We examined the 2015 earnings releases of 816 public filers that included a non-GAAP metric for net income, and how those companies then reconciled their numbers back to traditional net income under U.S. Generally Accepted Accounting Principles. The bottom line, so to speak: those non-GAAP metrics inflated net income by $164.1 billion over traditional GAAP numbers. Our report also looked at the details of those reconciliation statements, to see exactly how companies justified all those non-GAAP metrics. While a business can cite all sorts of reasons to adjust GAAP net income, we found that you can classify all those specific reasons into five broad categories: acquisition-related costs, debt, equity compensation, legal costs, and restructuring charges. The report quantifies how much each of those five categories contributed to the $164.1 billion difference in non-GAAP net income (hint: restructuring, acquisition, and equity pay costs are a large majority of the total). It also looks at non-GAAP net income metrics across nine business sectors, and includes a close review of three specific companies—Facebook, HP Inc., and Merck—that demonstrate particularly significant examples of non-GAAP reporting. You can download a copy of the report for free through Calcbench. We also have the underlying raw data for all 816 companies, plus a companion PowerPoint deck that examines the non-GAAP reconciliations for 10 companies with particularly large differences between GAAP and non-GAAP numbers. So what does all this talk about non-GAAP metrics tell us? A few things. First, clearly some companies use non-GAAP to create an alternate reality of financial reporting, where their views on corporate accounting are the correct ones. For example, Facebook (one of the companies we spotlight in the report) reports a non-GAAP net income metric that excludes equity compensation costs—which, under traditional GAAP net income, can’t be excluded. For 2015 that equity compensation cost was $2.97 billion, and excluding it increased “traditional” net income by 80.5 percent. [B]ecause of varying available valuation methodologies, subjective assumptions and the variety of award types that companies can use under FASB ASC 718 [which addresses equity-based compensation], we believe that providing non-GAAP financial measures that exclude this expense allows investors to make more meaningful comparisons between our operating results and those of other companies. In other words, Facebook believes that the accounting rule to calculate equity-based pay kinda stinks, so it uses its own metric that pretends companies don’t have to expense stock options and other equity compensation. The problem with this idea: companies do have to expense equity compensation, and they have for years. If Facebook believes that GAAP accounting on this point is flawed, that’s a question to bring to the Financial Accounting Standards Board. It isn’t a problem to be wished away with an accounting metric that contradicts what GAAP is trying to accomplish. Likewise, HP inflates its net income with a non-GAAP metric that excludes $1 billion in restructuring costs and $1.26 billion in separation charges. Together, those adjustments increased HP’s net income for 2015 by 50 percent. A company engaged in a restructuring or layoff program can legitimately argue that it should exclude those numbers from GAAP net income. The goal of financial reporting should be to give investors a true sense of the business, and a one-time phenomenon isn’t reflective of the company’s long-term operations. So when you see oodles of companies excluding restructuring costs (and in our report, you do), that’s not entirely unwarranted. HP, however, has engaged in restructuring programs every year since 2009. What’s more, the restructuring programs it announces in one year sometimes end up costing much more by the time they’re done. At what point do HP’s restructuring charges cease to be one-time pivots that lead to (alleged) future growth, and become de facto operating expenses for a company plagued by strategic missteps? What metric serves investors’ best interests? For all my skepticism of non-GAAP metrics, we should heed an important point: lots of companies use non-GAAP measures. In that case, it’s legitimate to ask whether the fundamental problem is GAAP itself rather than all the businesses trying to find ways around it. That’s the point Facebook is making, after all, in its adjusted net income that excludes equity compensation costs. Or it might also be the case that numbers important to investors aren’t addressed by GAAP. For example, retailers stress the importance of same-store sales and new store openings. Social media businesses dwell on the number of active users. Those metrics don’t directly touch on financial reporting, so GAAP is largely silent about them. But if they’re as important as companies insist, shouldn’t those numbers be audited somehow? The Public Company Accounting Oversight Board has its advisory group considering that very question right now, and a briefing paper published last month covers some of the PCAOB’s preliminary thoughts. Calcbench and Radical Compliance will be following the non-GAAP debate closely, rest assured. Meanwhile, download our paper and let me know your own thoughts.